A host of special methodological issues arise in any discussion of research on human behavior. This practical new volume addresses many of those questions with 19 superb contributions from leading experts in the field. The text evaluates specific strategies and techniques used in laboratory settings, including - reinforcement and punishment - stimulus control - behavioral pharmacology - and methodologies concerning verbal and social behavior, among others. The book includes 135 illustrations and a notable Appendix that offers the APA's ethical guidelines for research with human subjects. Illustrations note XIII, 669 p.
Basic Considerations: The Experimental Analysis of Human Operant Behavior; K.A. Lattal, M. Perone. The Human Subject; C. Pilgrim. 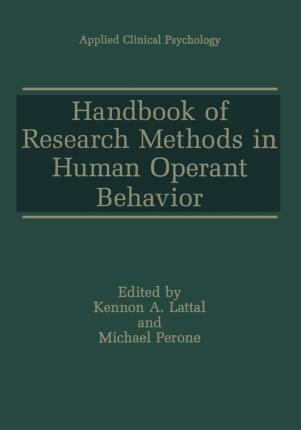 Experimental Design and Analysis in the Laboratory Study of Human Operant Behavior; A. Baron, M.Perone. Reinforcement and Punishment: Reinforcement: Schedule Performance; R.L. Shull, P.S. Lawrence. Choice and Self-Control; J.E. Mazur. Negative Reinforcement and Punishment; J. Crosbie. Stimulus Control: Stimulus Control Procedures; K.J. Saunders, D.C. Williams. Stimulus Equivalence; G. Green, R.R. Saunders. Remembering and Forgetting; J.T. Wixted. Psychophysics: Methods and Analyses of Signal Detection; R.J. Irwin, D. McCarthy. Verbal and Social Behavior: Behavioral Processes of Infants and Young Children; P. Weisberg, C. Rovee-Collier. The Verbal Governance of Behavior; E. Shimoff, A.C. Catania. The Taxonomy of Verbal Behavior; A.C. Catania. New Direction:. Establishment of a Laboratory for Continuous Observation of Human Behavior; D.J. Bernstein. Laboratory Methods in Human Behavioral Ecology; T.D. Hackenberg. Human Behavioral Pharmacology: An overview of Laboratory Methods; S.T. Higgins, J.R. Hughes. Appendix: Ethical Guidelines in Research with Humans (American Psychological Association). 3 Additional Chapters. Index.